The 1080p Full HD IPS display grants wide viewing angle, rendering vivid color and sensational impacts. Sharing game scenes with your partners will no longer be a problem. 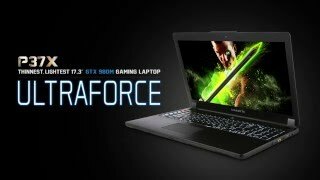 More links for "P37X V5-CF2 17.3" FHD IPS, Intel i7-6700HQ, NVIDIA GTX 980M 8GB GDDR5 Gaming Laptop"